Over the last year couple of years Labour’s lead has gradually been whittled away, from ten points in 2012 they are now holding onto only the very narrowest of leads, with many polls showing them neck and neck. At the same time we have seen UKIP’s support getting ever higher, with polls regularly putting them in the mid teens. One naive assumption could be that supporters have moved directly from Labour to UKIP, but in reality there is a lot of churn back and forth between parties. A political party could be picking up support from one group of voters, but losing an equal number of voters somewhere else. The voters now backing UKIP could be people who earlier in the Parliament were backing Labour, even if they didn’t vote Labour in 2010. Every month YouGov carry out around twenty polls for the Sun and the Sunday Times. In any individual poll the crossbreaks of 2010 Conservative, Labour and Liberal Democrat voters are too small to be robust, but by aggregrating up the polls from a whole month we have enough responses to really examine the underlying churn, and by comparing the figures from 2012 and 2013 to today, we can see how party support has changed. Here’s October 2012, a high point for Labour when they were enjoying an average lead of around 10 points in YouGov’s national polls. Labour’s vote at the time was very robust, they were making a very small net loss to UKIP, but otherwise their vote from 2010 was solid and they had added to it small amounts of support from 2010 non-voters and Conservatives and a large chunk of former Liberal Democrats. Lib Dem support had already slumped, with the large majority of their support going to either Labour or to Don’t know/Would not vote (DK/WNV). The Conservatives had started to lose support to UKIP, but it wasn’t yet a flood – they were also losing some support to Labour and a large chunk to DK/WNV. Moving onto October 2013, Labour’s lead had now fallen to around 6 points in YouGov’s national polls. They were still holding onto their 2010 support, but their gains from the Conservatives and non-voters were starting to falter. The movement of support from the Conservatives to UKIP had vastly increased, but part of this was balanced out by fewer Con-to-DK/WNV and Con-to-Lab switchers. The number of lost Tories was growing, but lost Tories were also switching their destination, saying they’d support UKIP rather than saying Labour or don’t know. The Liberal Democrats and Labour were also starting to see increased movement to UKIP, though at this point the big chunk of LD-to-Lab voters remained solid. Finally here is the picture from October 2014. Labour’s average lead in YouGov’s polls last month was just 1.5 points and their retained support from 2010 is now faltering. In 2012 20.6% of our polls were made up of people who had voted Labour in 2010 and would do so again, that has now dropped to 16.6%. Those 2010 Labour voters are now flaking away towards UKIP, the Greens and the SNP. Movement from Con-to-Lab has now dried up completely. The chunk of CON-to-UKIP voters has continued to grow, but mostly at the expense of CON-to-DK/WNV, meaning Tory support has remained largely unchanged. Most importantly that solid block of LAB>LD switchers has started to wither, down from 6.6% of the sample to 4.6%. The Liberal Democrats themselves aren’t doing any better, but their former supporters are scattering more widely, moving to the Tories, UKIP and Greens. Comparing the churn from 2012 and now you can see Labour’s issue. In 2012 all arrows pointed to Labour, they were picking up support from everywhere and holding on to what they had. Today they still have the benefit of a strong transfer from the Liberal Democrats (though even that’s declining), but they are leaking support in every direction – to the Greens, to UKIP and to the SNP. One of the reasons the Conservatives ended up falling short at the last election was that they failed to clearly identify themselves as THE party for change – the public wanted rid of Gordon Brown and Labour, but following the debates Nick Clegg managed to make many people think the Liberal Democrats were the more convincing alternative. Ed Miliband may face a similar problem, the government still isn’t popular and still has a relatively low level of support, but the anti-government vote seems to be fracturing away from Labour to alternative non-Conservative parties like UKIP, the Greens and the SNP. AW – thanks. Much easier to follow than a lot of words. The images are great and demonstrate the current situation in a very clear way. Conservatives losing mostly to UKIP might give them the confidence that a big UKIP squeeze could just edge them over the line. The Labour problem is that they’re leaking in all directions so whichever direction they move they risk losing on the other side. With current trends it’s hard to call, Labour still appear able to limp over the line but there is plenty of time for big events to shake things in any direction. I think that this is true, and accounts for the sense of paralysis as far as Labour goes. They’ve lost a lot of momentum over the past few months, and while they have held their cool well, they have not found any way of moving the prevailing narrative in their favour. Wow. What a clear, readable exposition. I feel I’ve learned something. 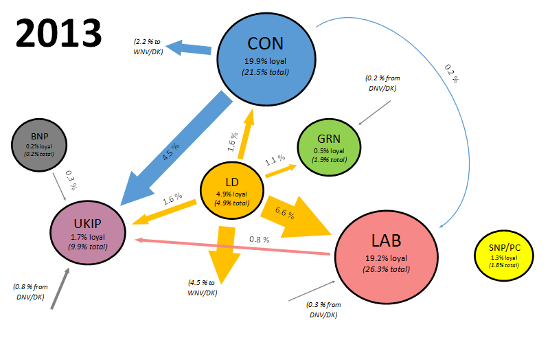 Still no evidence, highlighted by these excellent graphics, of any movement from Labour to the Tories. That’s the killer move for Miliband if it ever takes place, leading to inevitable defeat. He won’t be happy with the reduction in Labour VI, but the Tories aren’t benefiting from it at all and are losing voters elsewhere anyway. If a migration from Labour to Tory is not on the cards, and one would have thought at this stage of the electoral cycle that we’d be seeing this now if the Government was on course for re-election, then the Tories only hope of recovery is for their UKIP losses to return. I don’e see from these figures that they’ve got any other potential source of votes available to them. Labour, on the other hand, have multiple sources of potential support (Greens, UKIP, Lib Dems, SNP, PC etc) and I would have thought that the potential to tempt some of these back, many of whom have only recently departed, is better than the Tories chance of recovering long gone UKIP voters. If the Tories can’t tempt existing Labour voters on to their side then they’re basically stuffed, I think. It is now exactly six months until the 2015 General Election. Looking at the previous eight post-war Tory terms of office (1951-55, 1955-59, 1959-64, 1970-74, 1979-83, 1983-87, 1987-92 and 1992-97) the Conservative lead in the polls at this point in those parliaments was, respectively, -1%, +0.5%, -13.7%, -7%, +6.5%, +2%, -2% and -13%; But the Tory lead at the subsequent general election was, respectively, +1.8%, +4.2%, -1.9%, +0.6%, +15.2%, +11.7%, +7.6% and -13%. This means that the pro-Tory ‘swing back’ in the last six months of each of those parliaments was, respectively, +1.4%, +1.85%, +5.9%, +3.8%, +4.35%, +4.85%, +4.8% and 0%. This yields an average swing back of +3.37%. By applying this to the Conservative lead in today’s rolling average of polls (which currently stands at -1%) we are left with a projected Tory lead of 5.74% on 7th May 2015. In July this exercise yielded a projected Tory lead of +7% for the next general election. In August that figure fell to +4% only to rise to +6% in September and collapse down to +1% in October. Its recovery to +6% this month would, if it actually happens in May 2015, leave the Conservatives as the largest party in a hung parliament. This displays the wisdom of recording one’s panel’s voting before they forget what they did years after. I presume new panellists post 2010 have to be taken on trust? I think that YouGov keep track of the movement in what the old panelists said and use the change in allegiances since to weight panelists. Lets say that the panelists in 2010 gave Party ID as X 35%, Y 30% but when asked the same question now of the same people you get X 32% Y 36%. The new panelists joining now would then have to be weighted X 32% Y 36%. But it still points to a Labour victory. While the Tories think they can squeeze UKIP, I’d also expect Labour to squeeze the Greens (esp. since the Greens won’t stand in 1/4-1/3 of all constituencies). And let’s be honest, votest to the SNP matter little in terms who’ll end up prime minister, as the SNP is likely to tolerate Milliband but never Cameron. Oh, and to give you an example of media infatuation with Mr Forage, why did the New Statesman put a picture of him on the top of this article? A picture paints a thousand words. It is clear that UKIP has become the repository for the protest vote. I imagine there’s an interesting lesson here. My perception is that Lab decided to sit on its lead since 2012 presuming that doing nothing (eg not saying much about policy) would (might) retain those voters who had moved over to Lab. One can ask whether this was correct strategy. On the other hand…the Cons (and DC) have been constantly in the news (as you would expect from the party in office) and immigration (and the EU) has been rolled out regularly and noisily. The effect has been the rise of UKIP, with about 13% or so of the Con 2010 voters moving to that party. Also, of course, this Con strategy (if indeed it was that) has lead to significant erosion of the Lab lead. Has Lab or con pursued the correct strategy? Welcome to web journalism – three little letters matter here: SEO. I think CB is right about potential areas for Lab votes and I expect some recovery but also some foor the Tories. 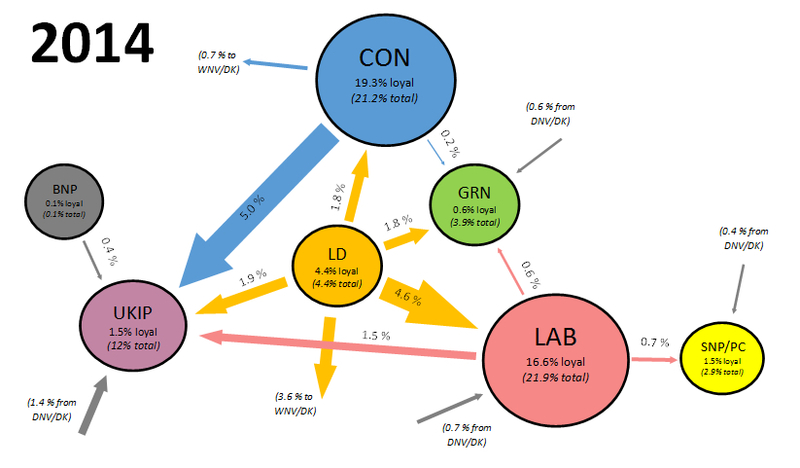 Absolutely fascinating graphics which dispel the myth that the drain to UKIP is 2:1 Con/Lab. More like 3.3:1. I would not write DC off yet, a targetted attack on UKIP aka giving No 10 to EM, plus a natural flow back could put them on 35%-37% by May. That is either a few seats above or below the line. Lab look like they are between rock and a hard place. You can see why they are in panic mode. YouGov notoriously undersamples NOTAs, and never corrects for that in their polling. This mattered rather less in the days when NOTAs were simply the disengaged and turnouts were higher, but it matters rather more now that NOTAs are a repository for many who felt disenfranchised by the 2010 party manifestos. Significant numbers of these people are now turning up with a determination to vote – most probably for a second tier party (UKIP/Green/SNP). The other point to note is where momentum lies. Subtract the previous set of arrows from the latest, and you find that recently Labour have been losing more votes than Conservatives to UKIP, for instance. In general, I would like to see pollsters produce full matrices rather than leaving us to deduce them from the presented data. The Comres Rochester poll did this, by including a column for DNV in 2010 which it had to weight upwards. It was very notable that it showed 25% of them as “certain to vote” in the by-election. Osborne saying the EU surcharge has been “halved”. Thanks very much Phil H (no relation to our Bucks buck are you?) and congrats on becoming Anthony’s spokesman. That does indeed seem a sensible method. If anyone has discovered what Table 4 and Table 5 of Survation are, seeing they both have identical descriptions, kindly let me know please? Excellent and useful analysis Anthony, but doesn’t this mean that the Basic, Advanced and Graphical Swingometers on the UKPollingreport site and the resulting UNS projection are significantly out compared to what would happen if an election based on recent 2014 polling happened tomorrow? 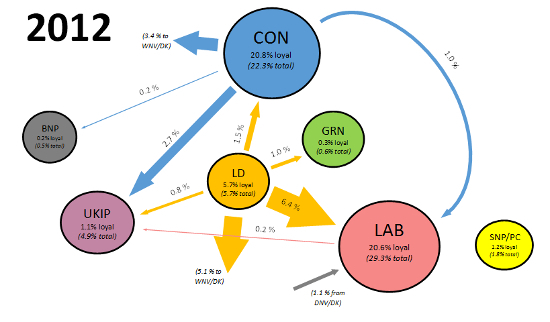 It seems that the Swingometers are flawed because the basic underlying assumptions and computations are all about three party dominance, and not the six plus party split we now have. This is especially the case in Scotland where the Swingometers just can’t cope with the sea-change of voting intentions towards SNP, and up the East coast of England where the Swingometers don’t predict any UKIP wins. Any chance of a radical overhaul of the underlying computations before the general election? There’s a report in the Indy that the LDs plan to seek control of whole Govt Depts in any future coalition. With the likelihood of more hung parliaments, it’s ironic that the LDs have moved from never having power, in living memory, to always being in the Cabinet, despite their vote-share plummeting. Waterborne – Scotland’s already there, look at the advanced version of the swingometer. UKIP are trickier. We don’t have the data to build a decent swingometer for UKIP. Using a uniform swing from their 2010 would, in my opinion, be deeply misleading. It would put their support very even across the country, and essentially shows them winning almost nothing unless they get a very high vote. I don’t think that will be the case in reality, they are stronger in some areas. The alternative is to come up with some notional distribution of UKIP support based on things like demographics, Euro and local results and Ashcroft polling, then take that as the baseline for swingometer calculations. That would be very artiificial and could end up being very wrong… but I wonder whether it could be the “least wrong” approach to take. Anyway, something I’m pondering for next year. I don’t want to do a pure UNS swingometer including UKIP as I think it would be misleading. But I might do some sort of **extremely heavily caveated** swingometer based on my best estimate of the distribution of UKIP support. NOTAs? Give us a clue. Anthony, are those not the same considerations made for the LDs. After all, on pure percentage basis, they wouldn’t get anything, would they, under FPTP? Anthony, thanks for your comments on my post. Your thoughts are always insightful and carefully considered, and you are the expert, so I look forward to whatever changes to the Swingometers that you think are appropriate. However, one further comment is that the UNS projection shown on the UKPollingreport home page seems to be based on the Basic Swingometer, and, if my understanding is correct, that doesn’t reflect the number of seats that Labour would hold if the latest two Scottish polls are indicative of the way votes would be cast. If, as you say, the Advanced Swingometer does take account of the Scotland situation, would it be possible to base the UNS projection on the Advanced Swingometer instead of the Basic one? As ever- whether what politicans have announced is true or not, or bears scrutiny or not, is NOT conducive to non-partisan discussion. Howard – yes, if I do try and come up with some sort of model it should probably try and cope with that somehow too (thought that would need to be a battleground thing). What excellent charts these are, they make everything very clear. And more potential places to lose support, especially after TV debates. – Does the pink (or is it purple?) column under ‘Latest Voting Intention’ represent UKIP’s share of the voting intention, or is it all others? I suspect not the latter because the totals don’t add up to 100%. To clarify this, would it be possible to add a pink box in the ‘UKPR Polling Average’ and an annotation somewhere to say what pink is? – Also, the ‘Poll Graphs’ page is often more useful than the table to see averages and trends, but it would be much more useful in the current multi-party-split of voting intentions if there were six lines on the graph instead of three, i.e. to include SNP, Green and UKIP on the graph. Sorry if this is yet more programming headaches! Keep up the good work anyway, and thanks. Excellent t analysis AW and now I’m understanding churn more. Looking at the 2014 chart. Labour do have some really big problems..ie UKIP, Greens and the SNP. I doubt even a waterproof membrane would stop the leakage Labour are cascading to other parties. From 2012 to now Labour have lost a 10% lead over the Tories and the Lib/Dem deluge to Labour now is nothing but a trickle. Waterborne – pink column is UKIP. Click on the “More…” under the current average and you’ll get the UKIP and Green averages too. Th only reason they fell short was (is) because of the electoral bias. Labour got a handsome majority in 2005 with just 35% of the popular vote, the Tories were denied a majority of any description with 37% in 2010. Maybe that’s how it should be when a party gets scores in the mid to high 30s, but let’s not kid ourselves that this is a level playing field. Labour has a massive advantage, and it’s one of the reasons why they tolerate awful leaders. ANYONE could be Labour leader and would have to work very hard indeed to lose a general election. Con needs needs an efficient vote distribution… more in line with Labour’s. There’s no gain in piling up votes in safe seats under the current electoral system. Hooked on this site again after a few years absence! Putting the numbers many posters are suggesting into the advanced swingometre as AW suggests, keeps coming back to Tories short by between 9 and 25 with a decimated LD party (funnily enough laying out their stall today for continuing coalition) who may not even get them to 326. So it looks like the Nats may have to come in to play as well, which is pretty ironic for the ‘English votes” party. Can’t see SNP propping up DC! It’s still all down to that final UKIP percentage. The lack of ConLab churn is truly remarkable and must be unique. Anyone using historical precedent to predict May15 from this position is whistling in the dark. I haven’t got the first idea what’s going to happen over the next 6 months. It does look like UKIP have hoovered up all the normal swing voters, leaving not much up for grabs between Labour/Cons. My point to  Pressman in the last thread. If your were to take away the labels from five of these “others” but not UKIP, and label them all social democrat, or class them by support for given policies, include retained membership of the EU, the movement from Labour is a movement in terms of either ” who best represents my views” or, increasingly likely as the GE approaches, “who is best placed to put my views into effect”. It is the latter which will possibly underlie a return swing to Lab, not I think available to Con on equivalent policies. I note reading posts up page, that the Tory failure to win a majority in 2010, was due to all sorts of ingenious reasons. Whilst the pies above are terrific for making sense of it all, I still believe that to much toxicity remained attached to the Tory party. I often see people say things like that, comparing the degree of churn now and then. However, go back ten years and opinion polls often didn’t give crossbreaks, so I’m dubious about whether they actually have any basis. Going back to the BES data I’ve picked a couple of elections. Too busy to comment in depth right now, will react tomorrow. But just wanted to pop by and note that this is an excellent blog entry. UKPR at its best – thank you Anthony and today’s posters. I think CB11 may have got it right about Labour’s potential pool of voters, but with a slight niggle in the back of my mind that, as has been said, multi-party constituency contests are difficult to call. All governments since the war that have served over four and a half years have seen a significant swing against them haven’t they? Labour 1950 Conservative 1964 Labour 1979 Conservative 1992 Conservative 1997 Labour 2010. So all things being equal “swing against” should happen in 2015 too. This must be at least as legitimate a view as the so called inevitability of “swing back” isn’t it. Judging by the reaction to the EU announcement, Osborne may not have done his party many favours. Again. I am afraid he’s probably more responsible for Tory polling woes than any other politician and it is only because of his behind-the-scenes machinations that there are not calls for him to be dropped. Were someone else Chancellor I think it very likely the Tories would have a comfortable poll lead. That’s been my lifetime ( well an intermittent 40 years) experience as a canvasser. In essence most elections in UK are won and lost on “differential turnout “. One of the reasons why my Party and I suspect others tell canvassers not to waste time arguing with opponents – the main purpose of the canvass is to identify where one’s supporters are and motivate them to vote. Of course the big picture is changing with the emergence of 4 or in Wales 5 or even 6 Party politics. But once the two main parties have shed the disillusioned to a smaller party, the two core Blue and Red voting blocs remain and do not usually defect to each other. Blues have a slightly smaller core vote which is older and more inclined to turn out to vote. Labour v.v. Incidentally I see this week’s US elections as classic differential turnout. Opinion polls show Republicans are actually less popular than Democrats. But their core voters turned out in Elections which did not change the executive Government in Washington. Many thanks, Anthony, for your charts; it will be the main resource for my lesson on Monday with Sixth Form Politics students. Joe Haines has written an article for today’s paper on the Labour Party, and it is well worth reading. He suggests that Labour’s polling figures would be improved if ‘the party’ removes Ed M, now.